Did you see it? March 19, 2011 featured a rising full moon – its exact full phase occurred within an hour of perigee, the closest point in the Moon’s orbit around our planet Earth. As a result it appeared 14% larger and 30% brighter than a full moon near apogee, the most distant point in the elliptical lunar orbit. 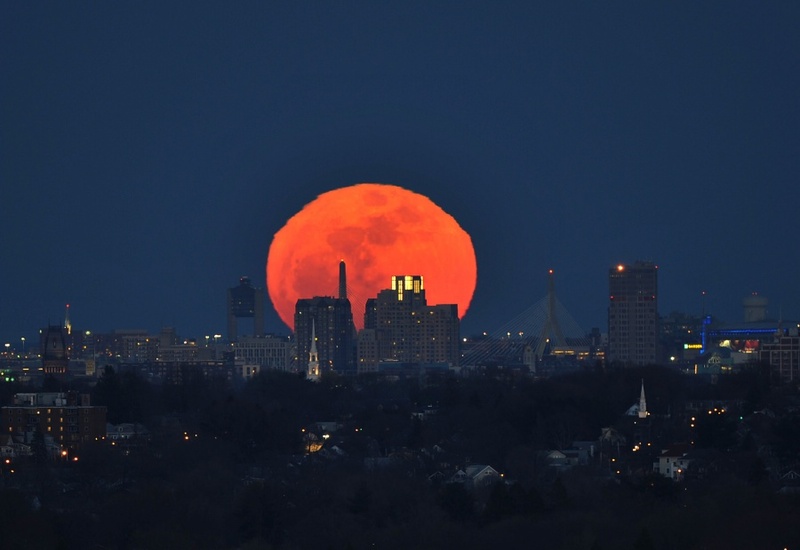 In the image above the near perigee full moon still hugs the horizon, distorted by atmospheric refraction as it rises over Boston, Massachusetts. 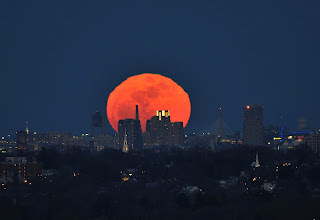 The shot was taken from Prospect Hill in Waltham, about 10 miles from the Boston skyline. Just to the left of the orange lunar disk is the distinctive control tower at Boston’s Logan International Airport. Topped by recognizable lights, the tall, twin towers of the cable-stayed Zakim Bridge spanning the Charles River are also featured in the night skyscape. I chose to feature the Boston scene here on the SLB because it is a city very dear to my heart. I should have been born an New Englander, with nearby attractions like: the Red Sox and venerable Fenway Park, the Charles, New England clam chowder, the Celtics, my favorite academic destination Cambridge, and of course Dover, New Hampshire.